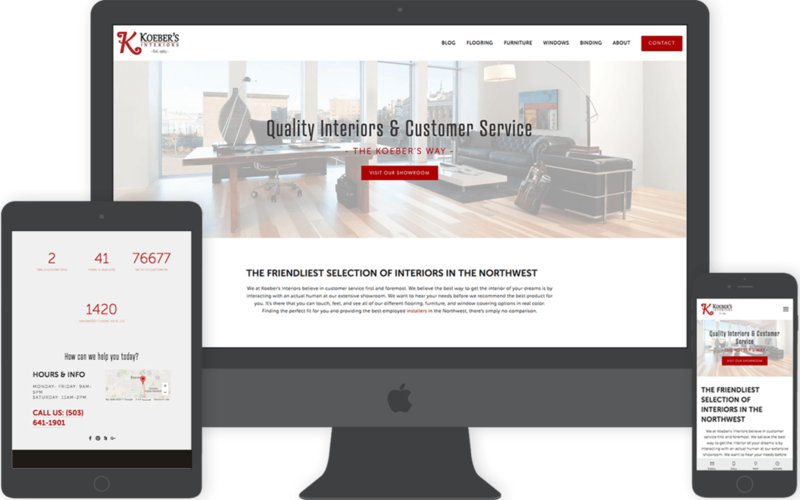 Koeber’s Interiors, a Beaverton business for over 53 years, was ready to modernize their web presence with a clean, easy to maneuver, informational, and mobile-responsive website redesign. It was critical that they achieve a backend ease of use so that the Koeber's staff could blog and update content as needed. We included a really nifty animated scrolling timeline on Koeber's Interiors new Squarespace site. It's not everyday you get a clever name and kickass band to design a custom logo for! The Horn Dawgs, based out of Scappoose Oregon, they are a rockin' 60's - 80's band featuring a full brass section (hence the "horn" in "Horn Dawgs"). They play a lot of classics including: Soul Man by Sam & Dave, Heartbreaker by Pat Benatar, 25 Or 6 To 4 by Chicago, and Superstition by the one-and-only Stevie Wonder. Wedding website created for Andrea and Orin featuring online RSVP; Bride, Groom, and Bridal party bios, accommodation listings, gift registry and more. A growing company's needs change very quickly. Back when we first started working with Smart Mobile Techs they only needed a simple site to explain who they are and help with onboarding new employees and technicians. Just a few short months later and their fleet of mobile technicians are out in the field and repairing phones in the most convenient way possible - by coming to you! We redesigned their site and changed the Purpose Driven Design of it to reflect a fully operational (insert Star Wars reference here) repair business featuring: an animated intro slider, service scheduling form, products and services with detailed descriptions, and restructured their FAQ and employee onboarding. An inviting and clean homepage with an immediate Call To Action for service scheduling. Their FAQ is designed with expandable content. Here you can see their responsive mobile view with minimized menu. Rates and Services images are large and easily clickable. Clean and simple design allows for a less confusing online experience for the customer. Team section with photos lends a "human" aspect to any company. From a tablet view, the menu expands off to the right when clicked. A wonderful photo above the final Call To Action showcases some of their service vehicles. Check out the latest addition to our portfolio. A complete, from the ground up, website build and custom logo makeover for Electric Machine Control Systems. Double Aught Ranch is the official rename of Wrangler's Western Bar & Grill in Canby Oregon under the new ownership of Claude DaCorsi. Along with all of the things that come with a transfer of ownership and rebranding Double Aught Ranch hired us to create a new and improved image for the bar. This included: a new logo, hand-drawn graphic artwork, new business cards, new menus, and a fully modern, mobile responsive, website capable of displaying all of their live music events and selling both tickets and merchandise online. All with that small-town western feel. If you're ever out in Canby and feel like listening to some live music, learning to line dance, enjoying some good food, or just need good atmosphere to relax and shoot some pool we highly recommend Double Aught Ranch. Complete custom Squarespace design from the ground up that included custom styling, full menu, events calendar, and online store. Double Aught Ranch requested two logos: one for broader use across many platforms one graphic drawing logo.The Cowboy Skull is original digitized artwork drawn by Cody Patey. Menus & Business cards designed for Double Aught Ranch. Three generations representing almost 70 years of experience and one of the biggest heavy machinery shops in Portland - Peniron was in need of a modern, SEO and mobile-friendly website, that was easy to navigate and professional in appearance. Featuring a carousel banner page and large photo gallery to showcase the wide array of projects PIW is able to both work on and produce. View the logo redesign process and finished product here.